A Catholic education is unique in its integration of religious truths and values with academic life. 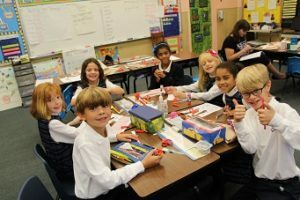 Saint Thomas Regional School educates and nourishes the total child: spiritually, academically, socially, and emotionally. Through active practice of the corporal works of mercy, our students do as Jesus did: love God and our neighbor. St. Thomas School offers a challenging curriculum that strives to meet the needs of various learners. Our school is a close-knit community with programs that seek to develop each child’s full potential. 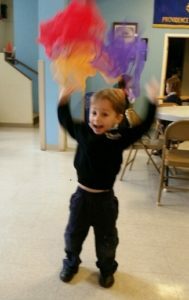 By introducing our students to various forms of expression we invite them to explore and find their gifts. Christ is the reason for our school. The Gospel values that Jesus taught are integrated in our daily life. Through active practice of the corporal works of mercy, our students do as Jesus commands us to do: to love God and love our neighbor. Therefore, service projects are an integral part of our religious education program. They include supporting food banks, gathering supplies after natural disasters and collecting money for charitable organizations and those less fortunate. Saint Thomas Regional School offers a challenging curriculum. The students regularly excel on standardized tests. Our school’s reputation is widely recognized by area Catholic high schools. Our program strives to meet the needs of various learning styles through the use of hands on activities and varied methods of teaching. 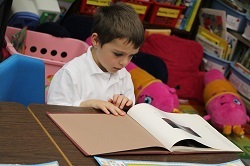 The focus in primary grades is intellectual development through hands-on techniques. Instruction in the intermediate grades centers around the development of study skills, reading in the content areas, and organizational skills. Middle school students focus on study skills, self-evaluation, and long term projects that ready them for the rigors of high school. Our school is a close-knit community. It has a wide variety of extra-curricular activities and enrichment programs that empower every child to seek out and enhance the gifts that God has given them. All of our programs seek to develop each child’s full potential. Introducing our students to various forms of expression invites them to explore and find their gifts.